American Wholesale Property: CASHFLOW Machine in one of Houston's strongest rental areas! CASHFLOW Machine in one of Houston's strongest rental areas! 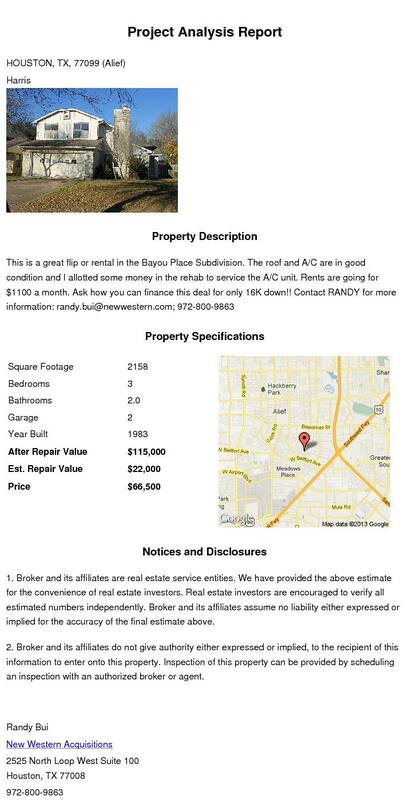 This is a great flip or rental in the Bayou Place Subdivision. The roof and A/C are in good condition and I allotted some money in the rehab to service the A/C unit. Rents are going for $1100 a month. Ask how you can finance this deal for only 16K down!! Contact RANDY for more details; 972-800-9863; randy.bui@newwestern.com.